I expect that this year, I will be able to cover something like 60 - 80% of my targeted annual expenses from dividends alone. This means that my forward dividend income will cover 60% - 80% of my expenses. My forward dividend income is the amount of dividend income I will receive over the next year from investments I have today. It assumes no reinvestment of dividends and no new capital being added. I believe that sometime around late 2018, my forward dividend income will be able to exceed my target monthly expenses and also have a neat little margin of safety as well. A margin of safety is important, because I want to have the luxury of never having to work for money again. A retirement where I have to spend time at a low paid part-time position does not seem appealing to me. This is why I believe generating a little more in dividend income than I need to is important, even if that means working an extra year. As I get closer to the finish line, I am starting to get a lot of ideas on how to increase dividends faster. You might remember this post that I wrote over an year ago. I think it is time to re-visit the ideas, and add some more meat. I am incredibly lucky that I have been able to share my dividend investing journey with you over the past eight years. I am also very lucky that I have always maintained a frugal attitude to costs, which allows me to save money that I invest in dividend growth stocks every single month. Every action I make today helps me get closer to my goal of living off dividends after hitting the dividend crossover point. Each dividend check is used to buy more dividend stocks, that generate more dividend checks for me. This is the power of the dividend snowball in action. I view each dividend investment as a small seed, which could snowball through the power of compounding into a mighty tree. When I decide to retire, I expect to live off the fruit from the seed I may have planted years or decades ago. With each $1000 investment, I increase the amount of dividend income I can generate. Every dollar I generate in dividend income is a dollar for which I do not have to spend 40 – 60 hours/week in the office. Every dollar allows me to buy my own time from an employer. I invest in dividend growth stocks for two reasons; the predictability of dividend income and predictability of dividend increases. I usually have a very good handle on the payment schedule of each dividend payment. I also know when to expect a dividend increase from each company I own. Most companies raise dividends once an year. A few select ones manage to boost dividends to shareholders more often than that. Either way, since I started tracking my organic dividend growth from my portfolio, the raises have been much higher than the raises I receive from my day job ( where I spend 40 – 60 hours/week). It is a very nice feeling to receive a raise for an investment that I may have done several years ago, without really having to do any subsequent work on it. Monitoring the rate of change in dividend payments is one of the things I look for when I monitor dividend growth stocks. A company that is experiencing short-term turbulence and still manages to deliver a substantial dividend increase signals confidence in the business. A company that tells investors that things are going to turn around quickly, but raises dividends by a token amount usually raises red flags in my monitoring process. In the past month, I bought shares in four dividend paying companies. Those purchases are in addition to the automatic dividend reinvestment I do in my tax-deferred accounts. The first two purchases were to existing positions, while the other two were for new positions. As I have mentioned before, I like to monitor companies by initiating a small position, and then add back when there is a better valuation. I didn’t add to the dividend stocks that I had on my watchlist, because I saw other opportunities for investment. For example, it made sense to purchase shares in Yum Brands and United Technologies on the dip, rather than buy more shares of Exxon Mobil which bounced back by 20% from its lows in August. YUM! Brands, Inc. (YUM), together with its subsidiaries, operates quick service restaurants. It operates in five segments: YUM China, YUM India, the KFC Division, the Pizza Hut Division, and the Taco Bell Division. Yum! 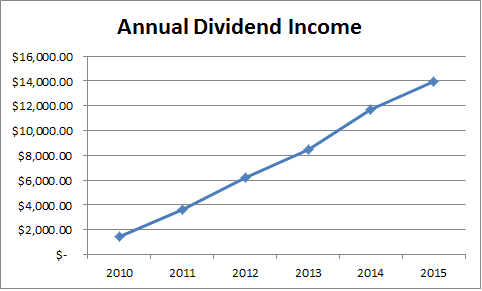 is a dividend achiever which has managed to boost dividends for 12 years in a row. The ten year dividend growth rate is 22.90%/year. The company recently raised quarterly dividends by 12.20% to 46 cents/share. I would estimate that the annual dividend growth over the past decade will be below 10%/year, which is still a very good growth. The company is selling for a little over 21 times estimates year 2015 earnings and yields 2.60%. When I bought the stock on October 7, the forward earnings had not been revised as low as they are today. My next purchase should be below $64/share in 2015 but below $72 for 2016 assuming 20 times earnings. I last analyzed Yum!Brands a couple years ago. I should probably post a refreshed analysis soon. Are low prices a justification to buy? Should I use stock prices in my screen? I read several blogs on investing. I have noticed that several authors have been talking about purchasing a stock that has gone down in price over a certain period of time. It looks like looking at a list of stocks at a 52 week low or looking at biggest losers year-to-date has been a criteria to some investors. I am going to explore this idea in this article, and share my ideas on the topic. Before I go any further, I want to mention that I am looking for companies that I can purchase at an attractive entry price, which can grow earnings and dividends above the rate of inflation, and can generate a decent yield in the process for me. At first, it actually seems like a nice idea to look for companies, which have declined in price. This could be one way to identify shares that could be theoretically cheap. We all know that a company’s cheap stock price can always get cheaper in the process. Of course, a stock price that has gone down presents an opportunity to buy more shares for the same amount of capital. In addition, by buying more shares, the investor can end up purchasing more dividend income in the process. So this sounds like a win-win ( win) at first glance. Why am I writing an article about it? Well, the problem with just looking at price relative to its high for the year or its close from the previous year is that price itself doesn’t tell you the whole story. What matters is price in relation to fundamentals, as long as those fundamentals are growing. As I keep learning more about investments, and expand my horizons through continuous reading about companies and by reading books about investing, I get to see recurring themes or certain aspects in a new light. Sometimes, I might read about an aspect about investing and brush it aside, although a small dot is kept within my brain waiting for the right moment to be connected to my overall investment strategy. My “eureka” moment of using tax-deferred accounts for income investing in retirement occurred in 2013. A few years ago, I had another “eureka” moment, which was related to using cash flow for analyzing investments. I started analyzing cash flow along with the income statement and balance sheets as I started reviewing pass through entities such as REITs and MLPs. As many of you know, I am a big fan of Warren Buffett and his writings. One of the recurring themes in his annual letters to shareholders and interviews is that he look for companies that generate excess cash flow, without requiring much in terms of capital investment to grow or maintain the business. In other words, he looks at businesses from the aspect of a business owner, in order to determine how much cash he can safely extract from them, without jeopardizing the investment success of the enterprise. The maximum amount of cash that could be distributed from a business to its owners is referred to as owner’s earnings. This is roughly equal to cash flow from operations, minus cash flows for investment such as Capex. The fact that Buffett likes to extract cash from businesses he owns through Berkshire Hathaway is one of the reasons why I believe he is in fact a closet dividend investor. There are generally two types of businesses that generate a lot of free cash flow. While I focus mostly on earnings, I do look at cash flow from operations, and then take out the expenditures needed for investing activities. That way I come out with the cash flow that is available to be distributed. This of course is a very high level view of the situation, and I do encourage everyone to review each situation one company at a time and delver into specifics. Should I buy Wal-Mart stock at current levels? On Wednesday, Wal-Mart (WMT) stock fell by 10% in a single day due to lowering its future estimates. This is a large drop from a company with a market capitalization of roughly 200 billion dollars and almost half a trillion in annual sales. As an investor, I can do two things – I can either buy more or not do anything. The case for buying more Wal-Mart stock is the fact that the shares are selling at a P/E of 13.10 and an yield of 3.30%. This is certainly the lowest valuation I have seen for Wal-Mart in quite some time. In addition, the company has recently approved a $20 billion dollar share buyback, which at current prices could retire approximately 10% of shares outstanding. While the company is expecting a hit to earnings through FY 2017 ( which is calendar year 2016), it then expects a rebound in earnings per share and slight growth. Furthermore, the company expects 3% - 4% annual growth in revenues over the next three - four years. On the other hand, there is also the case against buying Wal-Mart for a passive buy and hold dividend portfolio. The first reason is that there has been no growth in earnings per share for the past three years. It looks like there will be no growth in earnings per share in 2015 and 2016 ( equivalent to fiscal years 2016 and 2017). Growth in dividends per share has been anemic for two years in a row as well. As a result, the intrinsic value of the business is not increasing either. This means that the compounding machine is not compounding – it is just treading water. Back in May 2007 I had a net worth of $2,000. I then promptly exchanged most of that networth for an old vehicle so that I can get to work. I sold that same vehicle less than two years later for a loss of 80%. Luckily, I had better luck saving a large portion of my income every month, and investing it wisely. My savings rate has consistently been above 50%. Right now, my expected annual dividend income is scheduled to cross $15,000 for the first time ever. This number is calculated by multiplying the current annual dividend per share on each investment I own, times the number of shares I own. This includes everything I own in taxable and tax-advantages accounts such as my 401 (k). In other words, if I do not add any new cash to my investment accounts, and I do not reinvest dividends, I will be able to generate $15,000 in annual dividend income going forward. For the past eight years, I have managed to save money regularly, and put that money to work. I have focused most of my efforts on the process of selecting dividend growth stocks, discussing why I practice the dividend growth strategy, and sharing my progress towards my goal of attaining financial independence through dividend investing sometime around 2018. One aspect of my journey that I have always taken for granted has been my focus on keeping living costs low. After reading about the stories of others on their way to financial independence, and following personal finance blogs written by people who were in huge debt, I believe that I was wrong to never really stress the importance of frugality in my wealth building process. I believe that frugality is one of the most important factors behind my success. I define my success as the ability to cover monthly expenses through investment income. Based on my projections, I can cover somewhere between 60% - 80% of my expenses with the dividend income that my portfolio generates. The best part is that when I really started my journey in 2007, I only had $2,000 sitting in my checking account. I try to keep costs low, and try to be smart about finances. This means that the more I manage to save by keeping my expenses low, the more I will be able to invest for my future. I believe that being smart with my finances in my 20s is important. This is because the money I invested in my 20s will be able to compound for me for the longest period of time. By front-loading my savings and investment early in life, I will be able to enjoy compounding my money for the longest period of time. There is a misconception about foreign dividend stocks which can cost you thousands of dollars of lost dividend income. I see this misconception so frequently when I interact with dividend investors, that I have decided to note it, and end it once and for all. Let's look at the dividend payments from a few companies in US dollars and local currency. The first company is Nestle (NSRGY), a global dividend powerhouse which has managed to boost dividends in Swiss Francs (CHF) for 19 years in a row. 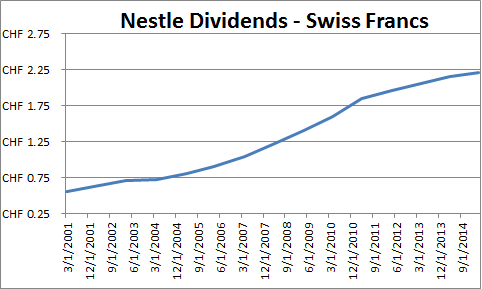 You can see that since 2001, the dividend payment in Swiss francs has been up. If you look at the payment in US Dollars however, you would think that dividends were cut in 2009 and 2015. This is a continuation of the article I posted yesterday. I focus on companies that provide essential products and services to their consumers. These customers use those products and services on a regular basis, and are usually loyal to those companies. The companies I focus on tend to be boring and enjoy slow but steady growth over time. These are our well-known dividend growth stocks. My favorite list is the one that David Fish updates every month. These boring companies generate so much in excess cash flow, that they decide to remove temptation from management, and send that cash to shareholders. These companies do not need to use all of their profits in order to grow and maintain their competitive position. This is because there is little disruption in the way people eat, drink or take care of personal hygiene. Despite all of that, most companies are able to sell more, innovate, and generate more revenues. This all translates into more profits, more dividends and incidentally pretty decent total returns. In fact, many of these great cash machines tend to get in the habit of continually raising dividends to their loyal shareholders, every year like clockwork. These companies prefer loyal long-term shareholders, and not a bunch of super caffeinated daytraders. The dividend payment is portion of the total return that is always positive, more stable than capital gains, and can never be taken away from you. In my reviews of individual dividend champions, which lists companies that have managed to regularly increase dividends for at least 25 years in a row, I have uncovered quite a few that were able to achieve this no small feat because their businesses were outstanding. There are only 106 companies on the dividend champions list, out of at least 10,000 publicly traded companies in the US, which explains why membership in this elite list is a small miracle. One of the biggest misconceptions that inexperienced investors make is to chase hot growth companies. The allure behind many of those companies is that they are in new and exciting industries that offer a lot of potential. New and exciting industries move the world forward and make everyone’s life easier. Unfortunately, investors do not always earn a lot of money this way. When I first became interested in investing about 15 – 20 years ago, I thought that the way to make money is by investing in hot growth tech companies like Amazon (AMZN), AOL, Yahoo (YHOO), Ebay (EBAY) etc. The problem with this statement is that when you have a new and disruptive industry, you also have a high failure rate of companies in that industry due to the speed of change. For example, today we have all witnessed the success of Amazon and Ebay. However, a lot of companies that were selling at insane valuations in 1999 – 2000 are no longer with us – those include companies like CD Now, The Globe.com, etc. When you have untested growth companies that sell at insane valuations, coupled with a high probability of business failure on those companies, you have a situation where an investor can lose a lot of money, even if they were conceptually right. Today, we are seeing this with companies like Tesla (TSLA), ShakeShack (SHAK) and Twitter (TWTR). They sell at insane valuations, and will only make money to investors if they do much better than their already rosy projections for the future. Investors seem to have forgotten the importance of pricing and valuation in security selection. This is a guest post by Mike, aka The Dividend Guy. He authors The Dividend Guy Blog since 2010 and manages portfolios at DividendStocks Rock. He is a passionate investor. If you read Dividend Growth Investor’s blog, you already know how dividend investing is a powerful investing strategy. In fact, for the past 85 years, dividend stocks have contributed 43% of the total S&P500 annualized returns.